When we come across these projects that haven’t yet made it to the public, we sometimes begin to hold our breath. Other UI concepts have been created that had the Android community pumped up, only to be bought out and never see the light of day. Let us hope that does not happen to this newest concept, Chameleon for Android. From the same folks who designed the BlackBerry Playbooks’s UI, comes a “launcher” or interface that looks to come straight out of the future. Chameleon incorporates useful and good looking widgets to allow the user to have everything they want/need, in a well-designed layout. Features such as facial recognition for different account holders is something that will make this launcher a huge success. If your family shares a tablet at home, then each user can have a separate account and layout for how they see fit. Crossing fingers that a manufacturer picks this up and throws it on as their skin. So the question is when can we throw our money at them. Unfortunately, all we have to go on is someone n XDA saying “coming very soon.” So until then, what do you think? 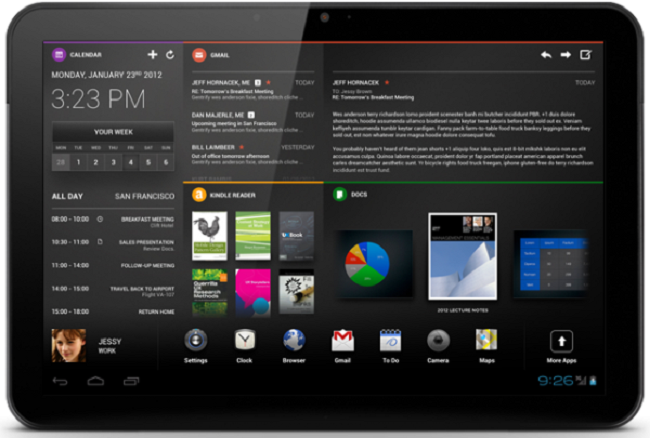 Does it look awesome and something you would want to have on your tablet?